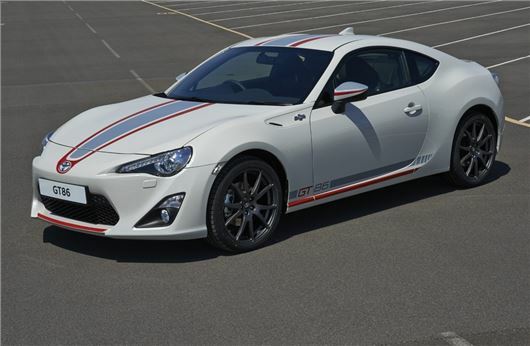 Toyota has launched a new special edition GT86 - the Blano. As you might have guessed, the Blanco is only available in a White Pearl finish. It's priced at £28,500 and goes on sale in July. To jazz things up a bit, the GT86 Blano gets a big red and grey stripe across the bonnet and roof as well as decals on the doors. Other details include red and grey detailing on the front lip, rear diffuser and door mirrors. There are also special 18-inch alloys with a 10-spoke design finished in Anthracite - that's dark grey to you and me. However, under the skin the Blanco is same as the standard GT86 with a 2.0-litre engine producing 200PS. Inside, the GT86 Blanco has full leather upholstery, heated front seats but if you want the Toyota Touch and Go navigation system it's an optional extra. Each model has its own numbered plaque on the centre console.